This month, more than 600 occupational and physical therapists, nurses, physicians and other providers attended the 6th Annual Johns Hopkins Critical Care Rehabilitation Conference, which bridges the interdisciplinary gap from research to the bedside, and brings together clinical experts who are creating cultures based on proactive rehabilitation. Johns Hopkins researcher and clinician Dale M. Needham, M.D., Ph.D., noted as early as 2008 that although deep sedation and bed rest have been part of routine medical care for many mechanically ventilated patients throughout the hospital including the intensive care units, emerging research in this field was already supporting the safety, feasibility, and potential benefits of early mobilization in critical care medicine, which includes reducing deep sedation and increasing rehabilitation therapy and mobilization soon after admission to the intensive care unit. Responding to clinicians’ requests for ongoing education and support, Dr. Needham and other Johns Hopkins colleagues have created the Activity & Mobility Promotion (AMP) multidisciplinary, interprofessional program that aims to support hospitals and health care providers that want to change the culture of patient immobility. 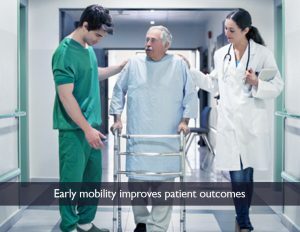 AMP provides frontline caregivers and hospital leaders with the tools and personalized support needed to design and implement structured quality improvement processes to successfully increase patient activity and mobility. The redesigned AMP website makes it easier to connect to AMP-ICU, PICU and hospital-wide programs as well as to both free and premium tools and services including e-learning modules and the newly released ICU Competencies. For information on the 7th Annual Johns Hopkins Critical Care Rehabilitation Conference in 2018, visit the conference site.